President Bush and Barney. Photo by Paul Morse, courtesy of the George W. Bush Presidential Library & Museum. 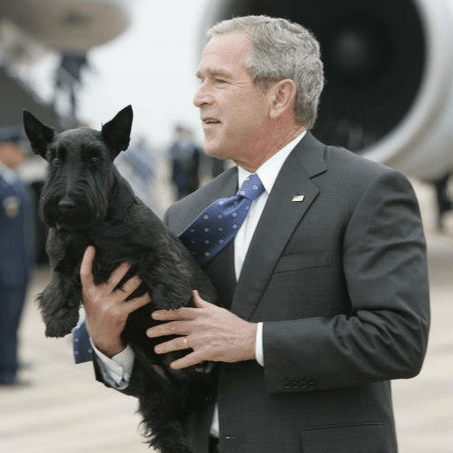 Barney, the 12-year-old Scottish terrier that moved into the White House along with former President George W. Bush and his wife, Laura, recently died after a courageous battle with lymphoma. Barney — a birthday gift to Laura in 2000, compliments of Christine Todd Whitman, governor of New Jersey at the time — basked in the pleasures of living in the White House for eight years. According to former President Bush, the much-loved canine was truly a faithful friend, never indulging in political discussions. Barney’s transition into life at the White House was one of ease. He would casually stroll down the halls of the West Wing, graciously accepting treats from his many human friends. With the expertise of a perfect gentleman, Barney welcomed many visitors into the White House, including prime ministers, queens, and heads of state. During the Christmas season, he would often give tours of this historical place he proudly called home. In all his years at the White House, he was known to have acted on his territorial instincts only on one occasion — biting a roving reporter who was on the North Lawn. President Bush and Barney indulged in numerous outdoor activities together, particularly fishing and hunting. Armadillo hunting was one of Barney’s favorites. He also enjoyed spending time at Camp David, where he relished chasing golf balls. Barney is survived by the Bush family, who miss him dearly, and their other Scottish terrier, Miss Beazley.